interchangeable lens cameras, itвЂ™s true: faster really is better. generation even faster, and more accurate. performance to let you shoot incredible images in some exciting ways. harnessing the cameraвЂ™s phenomenal speed to power clever new features. simple to share high-quality images. the camera as those already in our lineupвЂ”giving you the power to record still images and movies without compromise. flexible as it is fast. compromise when you want to travel light? 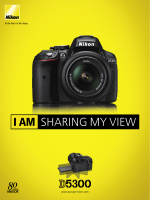 The Nikon 1 V2 ensures you donвЂ™t have to. and produces clearly superior results. a large grip facilitates comfortable handling. Built for lightness, this camera feels impressively solid in your hand. And the advantages donвЂ™t stop with the design. beautiful low-light detail. And if you want to shed more light on your subject, the built-in flash lets you do just that. to shoot scenes exactly as you please. NikonвЂ™s incredible hybrid autofocus system is now even faster. the frame, the camera will instantly switch to the 135-point contrast-detect AF. gives you the freedom to shoot moments as they unfold without worrying about a thing. that both harness the cameraвЂ™s pre/post capture technology to great effect. Press the shutter-release button halfway, and the camera quickly buffers up to 40 fullresolution images and simultaneously displays them in slow motion on the LCD screen. giving you the chance to choose the best shot for yourself, as it happens. Smart Photo Selector4 flies into action as soon as you touch the shutter button. youвЂ™re done, ultimately shooting up to 20 high-resolution images in quick succession. alternatives you want the camera to present you withвЂ”from five down to just one. so youвЂ™ll never again miss a smiling face or end up with a blurred image. Photos that move. Stories to share. Life never stands stillвЂ”why should photos be any different? with a photo of the moment when you released the shutter. a dry creek bed with friends. Snapshots to any platform and have fun sharing stories in a whole new way. the electronic AF drive control that regulates focus speed and eliminates mechanical noise. masterpiece, complete with soundtrack and credit sequence. the light, so you can enjoy impressive results. situations. Suitable for moving subjects, it delivers stunning images with natural contrast. Why wait until after youвЂ™ve taken a shot to see if youвЂ™ve captured a scene the way you want? results more intuitively than ever. the desired outcome. ThereвЂ™s no need to manually adjust settings and calculate abstract values. Control, what you see on the screen is exactly what you get. is the result of painstaking attention to every detailвЂ”including the controls. A number of refinements to the camera ensure operation is quick and reliable. cycles for superior speed and reliability. to the cameraвЂ™s shooting modes and creative controls. great photo- or movie-moment takes you by surprise. (35mm equivalent: approx. 50 mm) and fast f/1.8 maximum aperture. (35mm equivalent: 27вЂ“81mm) captures everyday scenes perfectly. (35mm equivalent: 27вЂ“270mm) captures movies, and stills, in superb clarity. A Nikon 1 camera isnвЂ™t just a great main camera. ItвЂ™s a superb second camera, too. factor and explore new creative ideas. telephoto reach of the NIKKOR 18вЂ“105mm AF-S zoom lens to 285 mm (equivalent). the camera to another deviceвЂ”or uploading them to the InternetвЂ”couldnвЂ™t be easier. shots of your best moves on the basketball court and then sharing them with friends! like NikonвЂ™s my Picturetown, simply insert an EyeFi card into the cameraвЂ™s SD card slot. make it simple to enhance images so they look great viewed on any platform. Get creative with light using this powerful Speedlight flash unit. from a distance with this handy remote control. to the right location with this tiny GPS unit. from dust, moisture, and scratches. camera, the microphone records crisp and clear audio. Approx. 530/1 lb 2.7 oz. 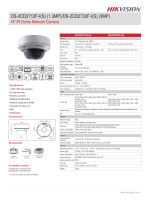 NOTE: Lens hood names indicate type: HN for Screw-in, HR for Rubber Screw-in, HK for Slip-on, HS for Snap-on and HB for Bayonet. 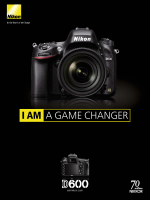 Nikon reserves the right to change the specifications of the hardware described in this leaflet at any time and without prior notice. 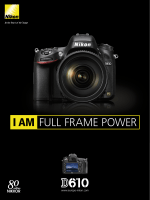 EXPEED 3A processes images at 850 MP/s with the Nikon 1 V2, and 600 MP/s with the Nikon 1 V1 and the Nikon 1 J2. Shoot full-size images at approximately 60 fps for up to 40 frames with AF fixed on the first frame. With AF tracking on, you can shoot at 15 fps for up to 45 frames. In single-point AF; based on Nikon research. 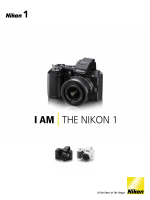 Smart Photo Selector is also available in the Nikon 1 V1 and the Nikon 1 J2 as a single shooting mode that automatically saves the five best shots. 5During movie recording (in movie mode), high-definition still images (approx. 14.2 megapixels; 3:2 aspect ratio) can be captured without interrupting movie recording. This still image is not a frame saved from the movie. Recording speeds in Advanced movie mode: 400 fps at 640x240 frame size or 1200 fps at 320x120. Max recording time 5 seconds. 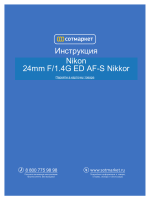 For accurate information about compatibility with F-mount NIKKOR lenses, please refer to the manual. AF/AE is supported with AF-S lenses only. Focus mode must be set to AF-S (Single AF) and AF-area mode is fixed at single-point with only the center focus point used. Continuous shooting with the FT1: applicable when an AF-S lens is used. Focus is locked with the first shot. liable for damages that may result from any mistakes that this catalogue may contain. Welcome to a phenomenally fast, ultra-portable, interchangeable lens camera system.